At Present Pakistan is Facing The Worst Floods of its 64 Years History. By These Floods almost 20 Million People are effected and 10 Million People Lost Their Homes. More than 2000 People Lost Their Lives. Although the Deaths in these Floods are less but the Destruction is very much. Even United Nation Secretary General Ban Ki Moon has said that i have never seen so much Destruction in recent times anywhere in the World. The Loss in Pakistan due to Floods is more than the Combined loss of Tsunami, Haiti Earth Quake and 2005 Azad Kashmir Earthquake. 1/5 Area of Pakistan is effected with Floods that is equal to total size of Italy. 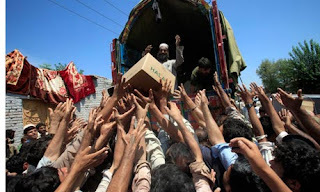 When Pakistan is facing such worst Floods the Aid that is reaching to Pakistan is very less. US and Western Countries are sending very less Aid to Pakistan. Even Muslims Countries are not helping Much the Pakistan Except the True Friend of Pakistan Saudi Arabia. Saudi Arabia has raised 107M US Dollars till now for Pakistan while Saudi Public has given 43 Crore Riyals to Pakistan For Floods. Saudi Arabia is also sending other needful things like Camps and Eating items to Pakistan. Other Muslim Countries have not helped Pakistan Much. The Most Surprising thing is that Iran that is Friend of Pakistan and Oily Rich Country has not given any Aid to Pakistan.